For those venturing into the fascinating world of DNA testing for family history, be prepared for the occasional influx of emails from prospective relatives. 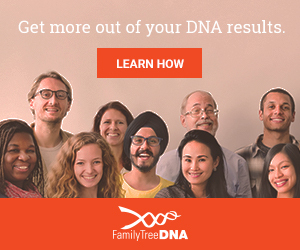 Autosomal DNA tests such as Family Tree DNA's Family Finder test have the potential to find hundreds of matches, initiating many new contacts via email. Once your results are released, your myFTDNA account will display a list of matches ranked by the closeness of their relationship to you. Note the page numbers displayed at the top left of the matchlist above. The last is page 49, meaning there are 49 pages, each with 10 matches per page - that's 490 matches up to 5th-remote cousins. New matches are added regularly, so the match lists are constantly growing. FTDNA's potentially free autosomal transfer program (of AncestryDNA or 23andMe results into FTDNA's database) will soon increase match numbers even more. Of the DNA kits that I manage, the minimum number of autosomal matches is around 400, but some have over 900 matches. The majority of the matches are in the 5th-remote category, but that still leaves many matches in the 2nd-3rd, 2nd-4th, 3rd-5th and 4th-6th categories. Only one of my kits does not have any 2nd-4th cousin matches - most kits have around ten matches in that range, although some have quite a few more. Most members of my DNA Interest Groups also have several 2nd-3rd and/or 2nd-4th cousin matches. Unless you recognise a match's name straight away and already know your relationship to them, some genealogical detective work and correspondence with your matches will be required. The outcome of all these potential matches is emails to-and-fro, particularly once you start testing more relatives. Under each match's name is an envelope icon which can be clicked to send an email, or hovered on to reveal the email address (visible in the bottom left corner of your screen). Send an email to your closest matches to introduce yourself and compare ancestral lines to see if you can determine your common ancestors. Examine their tree if they have added one to FTDNA, or ask them if they have an external tree that you can look at (eg. on Ancestry). Some of your matches will email you too, so be ready for them! Under each match's name is also a comment icon, which allows you to store notes. It is useful to record which ancestral line you may have isolated this match to, or note that you sent the match an email on a particular date and refer to the email folder where your correspondence for this person is stored. Any comments saved in this way do appear in this match's data when downloaded to Excel. This text field will store long notes, but it is more practical for shorter comments. You will need to keep good control over the emails you send to and receive from your prospective DNA matches, so I highly recommend practical and efficient structuring of your email. There may be times when you receive several match enquiry emails per day, especially when new batches of results are released. Keep your emails well-organised so you can easily find them again as you work through your family connections and need to recall conversations quickly. Create a folder for each family member that you test, create sub-folders for each test-type, for each project you join, and for each external site that you upload your data to. Then create further sub-folders under each of these as required, to store correspondence relating to each match. Note that Gmail uses labels and sub-labels instead of folders. Refer to YouTube tutorials on setting up Gmail labels if you require assistance. Being organised early on in your DNA projects will enable you to quickly relocate and manage your correspondence with each match, and after a short while you will be very pleased that you organised your emails right from the beginning. To the right is a (ficticious) example of email folders structured in Microsoft Outlook. Under your DNA Testing folder, create one folder for each person you test. If you do this at the time of ordering each kit, then you can use the folder immediately to store the confirmation email containing user account details, and the folder will also be ready for when you start sending or receiving emails in relation to the person tested. For each person tested, create sub-folders for each test type (eg. Y-DNA, mtDNA, atDNA), and within those test types create sub-folders for each match correspondant who contacts you in relation to that person and test. If you manage multiple kits and receive emails from a match in relation to more than one person whose kits you manage, you might decide to store all correspondence for that match in one tester's folder, or split it or copy it into more than one person's folder. The situation might vary depending on the particular circumstances, and whether the multiple matches are related to each other in-common-with the other person. I generally store such email correspondence in the folder of the person with the largest match, if they are related in-common-with each other. One example of this might be a parent and child/children who match another person, but the parent has the stronger match. Another example may be different cousins whose kits you manage, and they each match a particular correspondent (ie. subjects of triangulation). Use your common sense in these cases, or use a method or structure that is most practical or memorable for you. Inevitably, when you manage more test kits, you will find yourself corresponding with familiar contacts in relation to different matches - both yours and theirs. I no longer find it alarming when I see familiar match names or kit manager email addresses in the matchlists of those apparently unrelated to me (eg. my mother-in-law, or a cousin's cousin, or someone I'm helping in a DNA interest group). They are usually related through different ancestors, not in-common-with. This is where chromosome mapping and analysis tools become very useful! As for filing your correspondence in these more complicated situations, use your best judgment or what is most practical or logical for you! In summary, nest your folders or labels in a logical order that works for you. You may prefer to place Gedmatch under atDNA, ySearch under Y-DNA, mitoSearch under mtDNA, and projects under their respective test-type as well. Simply start with one folder for each person tested, and add test types, tools, projects and match correspondence folders as required. As you send and receive match emails, keep a copy in the relevant folder (or tag it with the relevant label or sub-label if using Gmail). DNA testing ultimately triggers emails from many matches and for different test types, tools and projects, and the volume will multiply for each additional relative that you test. Make it an enjoyable and exciting experience by being well-organised in advance. Even if you only manage one DNA test kit, be prepared from the start and make managing your DNA contacts a pleasure! What does a FTDNA test look like & how do I use it? Very informative blog post. Thanks!